Months go by without a single Mortlach review and then three come at once. 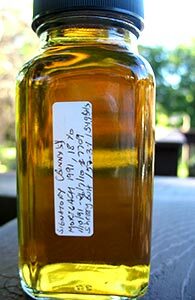 I mentioned this Signatory bottling in my post/comments on the Chieftain’s K&L exclusive Mortlach and then remembered that I had saved a 6 oz reference sample. The bottle it was taken from was opened almost three years ago, but the sample was from early in the life of the bottle and today was the first time I poured from it. This was a Binny’s exclusive some years ago. Binny’s also put out annual exclusive releases; usually from Signatory and Gordon & Macphail, and usually with a lot less fanfare than K&L–though to be fair, Binny’s are far more established and perhaps don’t need to make as much noise. Still, whatever the reason, I can’t say I don’t appreciate their more laid back manner. I will say though that of late K&L’s selections are far more interesting than Binny’s. Palate: Very drinkable at full strength with a nice oily texture. Flavours are very much as indicated by the nose at first. Then there’s more citrus peel (woody, dried tangerine peel) and some apricot jam as well. Closes with a fair bit of salt. With a lot of time to breathe it becomes quite a bit richer, with more dried fruit and raisins. And water brings out more dried citrus peel still; it also makes it a bit sweeter. Finish: The sherry separates just a little bit. Quite a lot of salt. Comments: This one needs time and attention. Not as voluptuously sherried as either of the two recently reviewed Chieftain’s K&L exclusives (the 1990 Mortlach or the 1990 Clynelish) it nonetheless has some good understated sherry character which intensifies with time and water. The nose in particular is quite elegant. If your preference is for over-the-top sherry, then this may disappoint and vice versa. There’s still some of this around for quite a bit less than $100. This entry was posted in -Whisky by Rating, 85-89 points, Mortlach, Signatory, Whisky by Bottler. Bookmark the permalink.